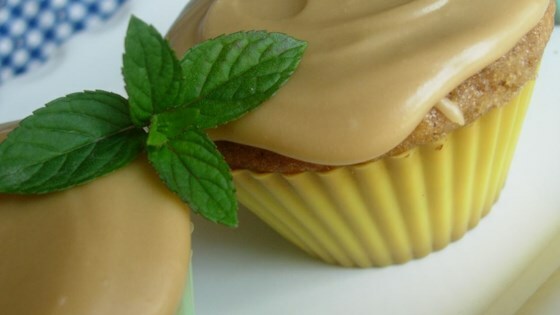 "This scrumptious caramel-flavored frosting is the perfect frosting for any yummy cake. It is perfect on basic yellow cake as well as homemade pound cake. Some love it on chocolate cake as well." Melt the butter in a saucepan over medium heat. Stir in brown sugar and bring the mixture to a boil. Reduce the heat and continue to simmer for 2 minutes, stirring constantly. Stir in half-and-half cream and salt and return to a boil, continuing to stir. Remove the caramel from the heat and allow to cool to lukewarm, then add vanilla. Gradually beat in confectioners' sugar with an electric mixer until smooth, being careful not to over-beat. If the frosting becomes too thick, hot water can be added to thin it out. Spread over a cooled cake and sprinkle with pecans. Allow the frosting to set before serving, about 15 minutes. See how to make a creamy, egg-free frosting for cookies and cupcakes. Outstanding! I followed the recipe exactly (except left out the pecans). It's delicious, creamy and caramelly. Perfect as written. I used it on an apple spice cake. Everyone loved it. Thanks. Delicious and fudgey just like it's supposed to be! I like this frosting because it can be enjoyed warm and didn't melt into the still-warm cupcakes. Perfect!